I am Isla’s oldest sister, Imogen. I am writing this to give my perspective on having Isla as a sister. I hope I can show you how having Isla as a sister has changed my life for the better. When I was 7 years old I was told I was going to have a new brother or sister join our family. I still remember the day I first meet Isla at the hospital and holding her for the first time. I thought to myself how cool it was that I was a big sister to not only one younger sister but now two. The first few years with Isla were normal. I remember her learning to crawl and walk just like any other normal baby would do. I was so amazed by this new baby sister I had and I absolutely adored her. When I was around 10 years old I wrote a speech for my class on Isla and just spent 3 minutes talking about what she looked like and the cute baby things she did. As Isla became older and as my family started to go through the long process of figuring out that she had 2Q23.1 micro-deletion syndrome, the difficult road for my mum and dad was just beginning but also for Carys and I as we started to adjust to this new life we now have. Although having Isla as a sister is the most special thing to happen in my life it does feel like sometimes Isla is the favourite. Although she is different to most kids her age to me she seems normal because I have grown up with her and can’t imagine her any other way. She gets away with a lot more than Carys and I would and when we don’t feel like doing something, we often play the ‘Isla doesn’t have to do anything’ card. It’s hard to understand that she probably will never do the same things as Carys and I do at our age such as chores and going to hang out with friends. It’s also hard for me to watch other people’s parents be able to come to everything such as sports games and for them to have more optional freedom and time. Both my mum and dad support me 100% and I know that and have known that my whole life but with Isla it often makes it hard for them to just go away for a weekend even now that both Carys and I are older. This brings me to my next point and how we are so grateful to have Bo in our lives. He has made us more confident to leave the house with Isla knowing that she isn’t going to run away or if she has a meltdown in public people won’t give us the death stare and think Isla is a spoilt little kid. My parents are now more available to come to my rowing regattas and watch me do what I enjoy as a sport. Finding someone to look after Isla while Mum and Dad both came down to Karapiro to watch me race was something that didn’t happen that often. Now even Isla can come watch me race which is so awesome. Wow, thank you for sharing your thoughts Imogen. This was so heartfelt, beautiful and honest. I could relate to your thoughts and feelings as I have two daughters, one with very high needs who was also born with a chromosome disorder (7q 36.1 – 36.3). She has just turned 12 and she also has a sister but younger who has just turned 10. I know how hard it has been for her too, growing up with a sister who demanded a great deal more care and attention due to her high needs. It has been a very steep learning curve for her and there have been some very difficult times, it was very hard for her to understand her sister’s needs when she was young. My youngest like you had to learn quickly and with unconditional love. She has also seen her sister just as any other ordinary sibling but has always known there was something different about her. It’s only been in the last year that she has come to understand more deeply and empathise with her sister’s daily struggles which she now knows won’t go away anytime soon. 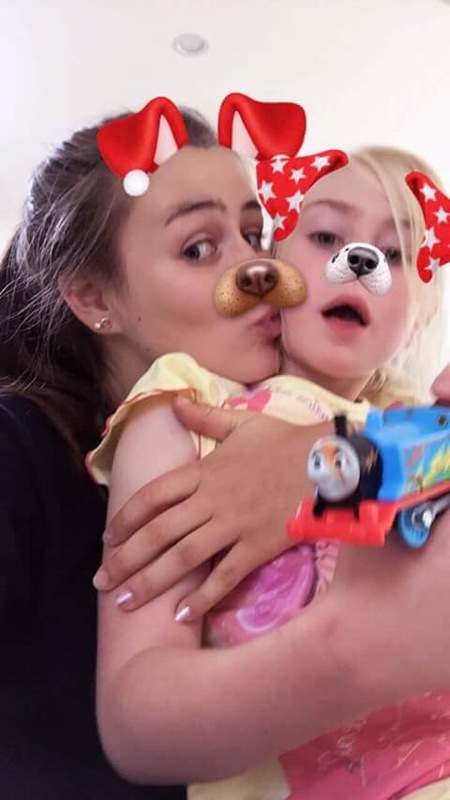 I am very proud of both my daughters but in particular I am blown away by my youngest’s love and patience and empathy towards her elder sister and her maturity which is beyond her years. Their bond is so strong and I can sense that bond between you and Isla too! Well done Imogen. My sister (22q11.2del) and I have decided to share a house together – we’re a lot older than you and our age gap is bigger too. Through her I have got involved with Special Olympics and other disability support services and have found a lot of new interests and friends.